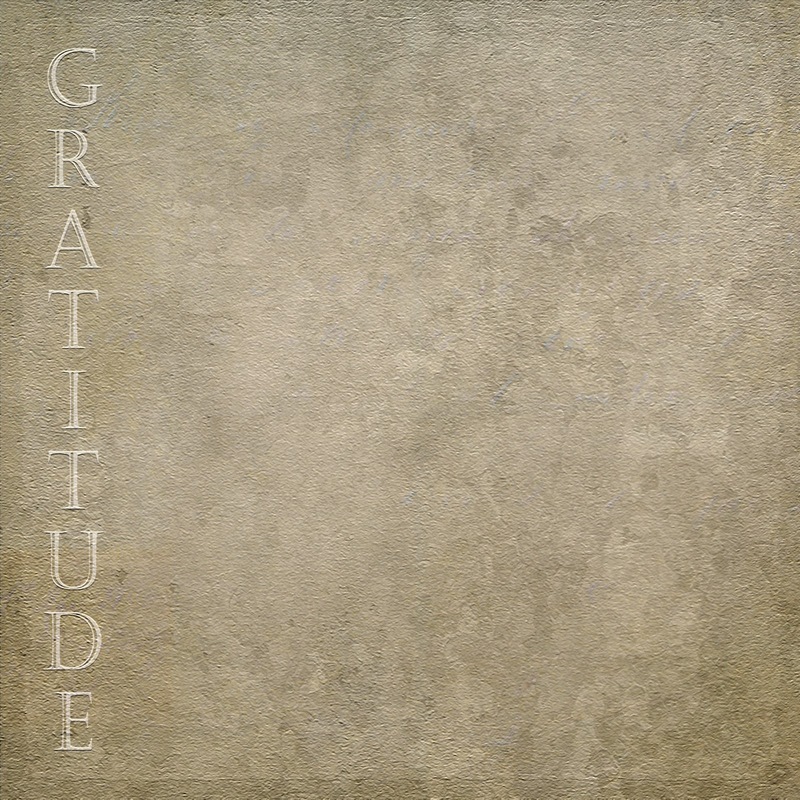 I did a little experimenting with the new free texture called Gratitude 2. If you didn't pick it up yet, you can do so by going here. Here, Gratitude 2 is applied to a photograph of branches of red berries against a blue sky. This application was blended in Difference at 95% opacity. 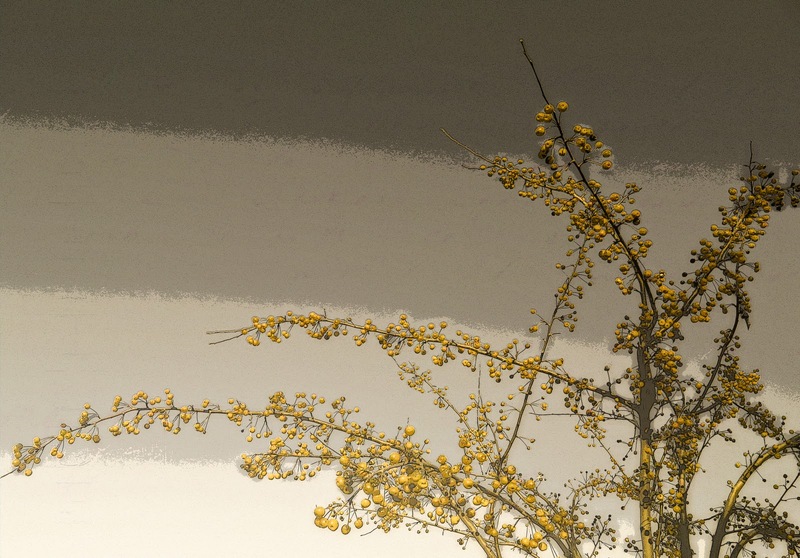 Look at the surprise I had when I tried the Blend Mode Hue (100%) opacity. The background seemed to divided itself into arcs of color without my needing to do a thing! Love the effect! 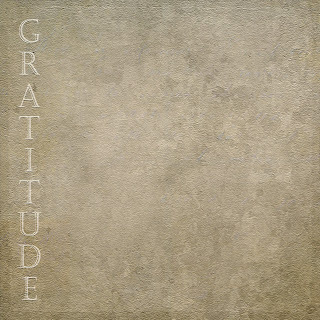 The word 'gratitude' also disappeared with the use of this blend mode, without my erasing it. Here's basically the same effect using Saturation Blend Mode at 100% opacity. I love sweet surprises on a Monay morning. I hope some of you will let me know if you get similar effects with this texture in those two blending modalities. Keep your eye out for another free texture coming soon. And don't forget ... this week's Photo Art Friday is an easy one. Simply link up a piece of photo art from your archives that has never had the attention it deserves. Easy peasy! :) See you soon. Sharing with Lisa Gordon's The Creative Exchange. This is a great texture Bonnie, thank you, and the timing is perfect! Such amazing difference Bonnie, and all very beautiful! I absolutely love the first one. I've got to go and play now. Wow, so beautiful! How absolutely gorgeous. Thank you so much for sharing free textures - I appreciate it very much! Oh very cool Bonnie - I too love a surprise!! Thank you and happy Monday! I enjoy the PS surprises. Yours are certainly beautiful. I am always surprise by how the different mode used on the texture, can effect the whole image. Bonnie thanks so much for this great texture! Going to go try it out right now. You are simply wonderful and the textures do some amazing things to the photographs! I really do need to learn how to do this! Wonderful new textures. Great work ! I gave it try ... thank you so much. These are all really lovely! Great new texture! Wow! What fun you had with this texture! I always run through the blend modes when applying a new texture... you never know what you might get!